Ok - this is going to be chatty - no deep thoughts or inspiring words or even profound imagery. Just me and my thoughts and maybe you reading them. So hear goes. Ever see on your calendar a few days in a row that are ::gasp:: empty. I mean - nothing written on them - really. Not a single 'have to' or 'should' (well - there are always shoulds). No appointments, no deadlines - just little empty white squares with nothin' in 'um. For me - this is dangerous. Especially when I see them a month or so in advance. I take a moment to think hard on this amazing reality - really Suzanne? Really blank? If the internal answer, based on external circumstances, comes back "yes" well - that's when my normally controlled and under-active creative energies go - "Oh Yea, Let's Party!" And that is just what has happened this Memorial Day weekend - yes weekend. All day Friday, Saturday, Sunday AND Monday. Four - count them 4 whole days to....to...? First thoughts were, "Great, I'll go away, go on an adventure - camping, canoeing, or do the City - art museums, see a show, or go visit friends and family, etc..." After checking in with the loving spouse my initial "go & do" bubble burst - I may have 4 blank days - in a row - but he does not. "Rats" as the beloved Peanuts character, Charlie Brown, used to say. Besides, God had other plans for these open spaces - in fact, it was the vision that I had (really Divinely inspired) when we first moved into our house 5 years ago. You see the previous owners had a vision of their own that was only partially realized - a large above ground aluminum framed swimming pool with attached deck. We know this because they left behind a flat area dug out of an all slopping yard and a 4' x 21' cider block wall (to hold the hillside back) and all the pieces and parts of this pool meant to be assembled. Since our children were up and out in their mid-tewnties and we had just finished taking care of an in-ground pool we had at our last house, we weren't to eager to go that route again. Besides, the many pieces and parts came without instructions so it all became scrape metal for income towards the next project - make that projects! Fast forward to this weekend. We are, God bless my husband, filling this wonderful open days with a vision FULL of outdoor projects: The flat area was calling to be become a labyrinth - a walking pathway in a scared circle for meditation, contemplation, centering prayer and time with the Holy in a lovely tree surrounded, bird song setting. The wall was calling to become a beautiful mural - a place for visual inspiration and creative expression, a focal point to enhance the walker experience. The space begs for a waterfall - soothing sounds that surround you, light sparkling on the water both providing a sense of peace. As these projects are in the making not only by me but also with the loving assistance of dear friends and family members, a deep longing id fulfilled, awesome creative energies are explored, a sense of accomplishment is felt and a vision is realized. Most importantly, the results of these four days will provide a place for people to come and participate in a drawing nearer experience with God. So God, please bless all our hands and this place as we offer it back to you. Call all souls who you know need a place of rest and inspiration to come. So be it. For me, that's letting my wonder ring - as in ringing true. It's like opening a big space inside myself and letting the sound of me ring around. 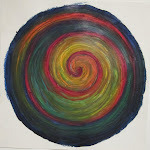 The more I am open to wonder ring the more the internal sounds echo, linger, create harmonies. I wonder if God wondered - you know wondered us and all of creation into being. In the beginning was the Word - the sound - we are spoken - rung into existence. Vibrations of sound waves creating patterns, colors - even light itself. And it was good - yes very good! Try it - try wonder-ring. Create an open space inside yourself where sound - the Word - can reverberate beautiful harmonies within you. Then -- watch light sparkling on water, listen to the wind in the trees, soak in the colors of a flower, touch the softness of the skin of someone you love, taste your favorite fruit and let your self - wonder.